Although solid fuel has become a desirable source of heating, many homes are now built without chimneys or for some reason the chimney breast and/or stack has been removed. The installation of a twin wall system allows our customers to have a wood burning or multi-fuel stove in their property where a masonry chimney breast or stack isn’t present. This means you can have a stove in a conservatory, barn conversion, extension or anywhere else in the property where there isn’t an existing chimney stack. Giving even the coldest part of your house the advantage of not being shut down due to exessive cold during winter months. By using one of these systems internally or externally, the flue gases are insulated from the cold elements and this helps the warm flue gases not to cool down as they rise. If the flue gases cool down too much, they will not leave the chimney or lining system and the stove or fireplace that is being used will not draw properly. 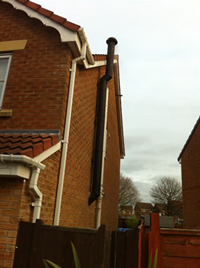 A cold flue is like having a blockage as smoke comes back into the room when you open the door to re fuel the stove. On the free site survey, our Hetas engineers can advise on the correct stove for the size of room it would be installed in. You may want us to supply the stove that best suits your needs which we can accommodate by having access to the industrys leading manufacturers. Our Hetas registered stove fitters can install the twin wall flue chimney to the front, rear or side of a property internally or externally. Being Hetas registered also enables our engineers to sign off their own work therefore saving the customer hundreds of pounds, as the need for a building control officer or associated costs of the visits aren't necessary.